We use a tool called ‘Odin’ for flashing firmware to Samsung galaxy devices. The Odin tool was officially developed by Samsung Labs and now it’s available to every developers and we can also use this tool for officially flashing samsung rom’s. Download Galaxy J3 firmware from below and flash using Odin. Install Samsung Galaxy J3 Firmware below. Samsung Galaxy J3 hit markets on 2017, July. The phone measures at 143.2 x 70.3 x 8.2 mm with a 5.00″ inch display with a resolution of 720 x 1280 pixels and 294 ppi density. Galaxy J3 is powered by Exynos 7570 Quad, Quad-core 1.4 GHz Cortex-A53 with Mali-T720MP2 graphic chipset. Total memory available in this phone is 2 GB ram with 16 GB internal memory and is expandable up to 256 GB. This phone featuring 13 Megapixel rear camera and a 5 MP shooter for taking selfies. Samsung Galaxy J3 packs a 2600mAh battery and weights approx. 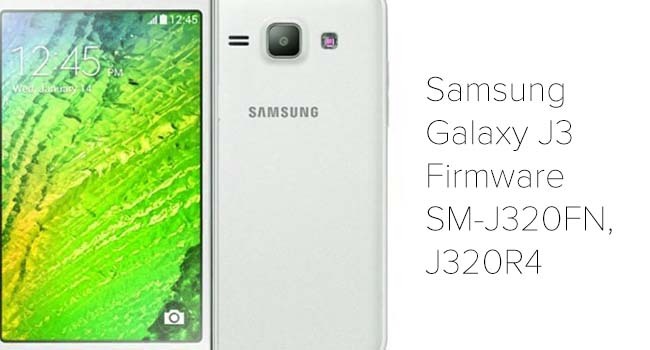 142 g.
Below you’ll able to find all Galaxy J3 series devices firmware. Find your device from the list below and download the appropriate rom for your phone. You can find your phone using model number, we have provided all devices model number next to the device name. Still if you don’t have a clear idea about what you want to do, please do ask me by commenting below. Flashing firmware’s or custom rom’s to Samsung devices is as easy as updating your device to latest version of android. There are Recovery mode & Developer mode available in Samsung devices, we use download mode for software upgrade or downgrade purposes and using recovery mode we can factory reset or clear data/ cache from phone. We use two different key combinations for both modes and we had explained it below. In this post we provide links for your device OS file and you need this file to reinstall or upgrade the OS in your phone. We use a tool called Odin to flash this file to Samsung phones. So please find the appropriate download link for your phone and installation steps below.